Test your bakery ingredients through to finished products. 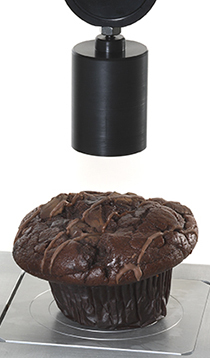 The TA1 texture analyzer, combined with one of our grips and fixtures for bakery testing, is capable of testing bakery ingredients through to finished products. The effects of ingredients from different suppliers, baking times and recipes for the finished product can be rapidly measured and captured. Dough extensity, dough stickiness, creep/relaxation, firmness/hardness, fracturability, springiness, cutting resistance, tensile strength, hardness of breadcrumbs and puncture of thin breads, pancakes and tortillas are just a few of the test types that you can perform with our food grips and fixtures for the bakery industry. View the application note Bakery Testing to learn more about our grips for testing in the bakery industry.